When I was a kid the only empanadas that were sold on the streets or at restaurants were the “church style empanadas”, meaning the normal ones made with hominy corn or precooked cornmeal and filled with either beef or chicken, that’s it. Years later, when I visited Colombia I saw a huge number of restaurants specialized in all kinds of empanadas, including the ones made with flour and filled with all kinds of ingredients like ham and cheese, mushrooms, pepperoni, pork belly, you name it. 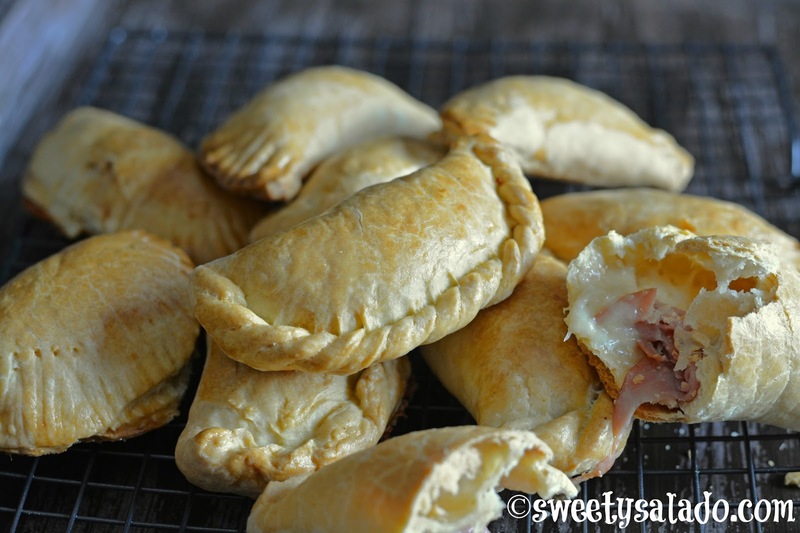 After posting two Colombian style empanadas on the blog, which are the beef empanadas and the ones filled with chicken, many people asked me to make flour empanadas or empanadas that could be baked in the oven. 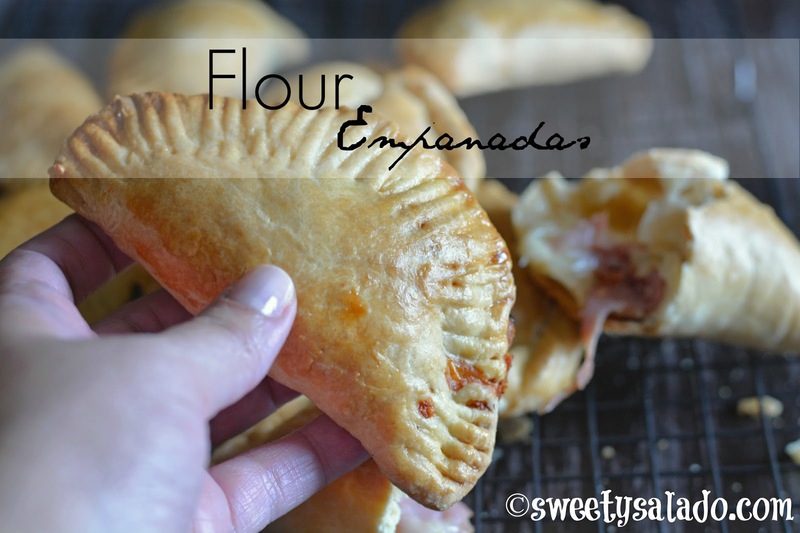 Since then, I have really wanted to share a flour empanadas recipe but had not been able due to lack of time, until now. The recipe is mainly on how to make the dough since you can fill them with any ingredient that you want. Today, I’ll be filling them with ham and cheese but you can also use the filling I used for the other two empanada recipes. In a large bowl mix the flour with the salt. Then add the butter and crumble it with your hands or a fork. This process can also be done in the food processor. Now, add the egg and water and knead the dough until firm but don't overwork it so your empanadas don't come out too hard. Add more water if you see that the dough is too dry. Knead dough for a few minutes, form into a ball, wrap with plastic wrap and refrigerate for about 30 minutes to 1 hour. Roll out the dough on a floured surface with a rolling pin until it's really thin. Cut out the dough into medium sized circles (approx. 4-5 inches or 10-13 cm) with a large cookie cutter or a bowl. Fill the empanadas with the filling of your choice, cheese, ham and cheese, chicken or beef, moisten the edges of the dough with a little bit of water, fold it over in half and seal the edges with your fingers. Now, twist the edge by folding over one of the corners with your thumb and pinching it. This will form a new pointed edge, fold this new edge over with your thumb and pinch it again. Do this until you reach the other corner of the empanada. Brush the empanadas with the beaten egg and bake for 35-40 minutes or until golden brown. You can also fry them at 350ºF (180ºC) for about 6-7 minutes or until golden brown. Bring extra waters if you ever notice that a dough is definitely very dry up. Rub dough for a couple of a matter of minutes, sort to a tennis ball, hold by using vinyl hold plus refrigerate for a half hour to at least one an hour.